Lately I haven’t been very active in the kitchen. In fact, I am not sure what we’ve been eating for the last eight weeks. In October I started a part time job in the evenings which really threw me out of my routine. Three and a half months later and I am still trying to adjust to not being home at night. I know many people work all kinds of hours and make things work but for some reason it has been incredibly hard for me to figure out a cleaning, doing laundry, cooking, and playing with my daughters routine that works for us. I have good days and other days I would be embarrassed if anyone popped in and saw the condition of my house or that my children were eating ANOTHER peanut butter and jelly sandwich. These cookies are perfect for the parent who’s life is a little hectic. I have no doubts you could whip up a fresh batch of cookies just as fast as you can make these, but I just happened to have a boxed cake mix that has been sitting in my pantry for quite some time and I remembered making cookies from a cake mix when I was a teenager. I love cookie recipes that have a baking time of only six to eight minutes. There are times when having a fresh warm cookie as quickly as possibly is just what you need er-want. What I love about these cookies is that they are quick and easy to make, and they bake up to a perfect soft vanilla-y cookie. Funfetti cake was one of my childhood favorites. Sprinkles in the cake and in the frosting?! What child wouldn’t want that for every single birthday cake? This recipe is the result of the famous Pillsbury Bake Off contest.Â I didn’t have a Funfetti cake mix so I used a white cake mix and followed the recipe for the cookies as written, just adding in a couple tablespoons of sprinkles at the end. 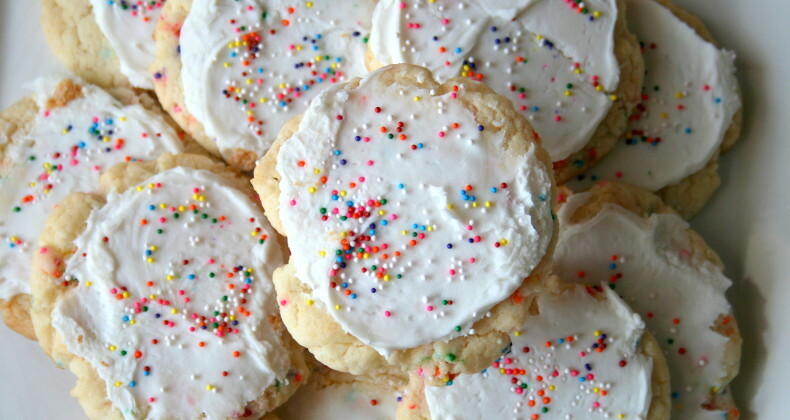 The fun thing about these Funfetti cookies is you could make them for almost every holiday or season since Pillsbury makes different seasonal Funfetti mixes. Have you ever submitted a recipe to the Pillsbury bake offÂ contest? What is your favorite quick to make cookie recipe? In a large bowl mix together cake mix, oil, and eggs. Stir until well combined. Roll dough into one inch balls; place two inches apart on ungreased baking sheet. Dip a flat bottomed glass into flour and smash the dough balls to 1/4 inch thickness. Bake for 6-8 minutes. Cool for 1 minute on baking sheet before removing to cooling rack. Frost while still cookies are still warm. Sprinkle frosting with Funfetti sprinkles. Let frosting set before storing. Oh these cookies look great! Thanks for the comment on my blog! I wanted to let you know I recently took a vegetarian indian cooking class – I’ve posted some of the recipes I’ve tried at home under the “asian” category on my blog! I’ll be posting another one sometime in the next week or so as well! Ahh I love Funfetti! Yum!